Ahhhhh Rat Trap. These guys were amongst the first to send me their music when I was a younger music writer believing I had an opinion worthy of putting into “I like this, I also like that” sentences. These guys have released two albums and now comes Halfway To Infinity, their third and final album for the time being, so it only makes sense to add their big stepping stone to my big stepping stone. These guys produce a kind of lo-fi-ish pop/indie sound that’s usually lush with acoustic numbers and electric tunes that are full of lovely arrangements and melodies to always produce records that are always at the very least, lovely. Halfway To Infinity kicks off with Canoe, which is a fast jangly number complete with warm acoustic guitar and vocals that paint a picture of somebody sitting along the seashore with waves and water and seagulls squawking in the wind and pooing on your head. It’s a light hearted sounding track full of illustrations that ease you into feeling safe about listening to this album. Canoe Part IIcontinues the journey with a slower paced instrumental and vocals that once again give way to a big musical finale with what sounds like a touch of electric guitar coming in to lay down some melodic parts to create a moment that makes me wanna gobble it up like a big platter of musical salmon or something. What makes this review even more special for us apart from it being Rat Trap’s last album (for a while) but because they have a song on here that’s called EXPLODING HEAD SYNDROME. I swear we didn’t plan it or anything. Fortunately the track that shares our name is awesome, and perfectly depicts the condition. With scatty guitar riffs and lyrics talking about doctors and drinking milk it truly is something that allows us to feel safe in choosing this name. I just thought it sounded cool, but Rat Trap have helped made it sound REALLY cool. Are is another delightful track with a piano-driven instrumentation that Rat Trap use to fit in with the vocal hooks to create extra hooks on hooks which blows my mind. Acoustic guitar is strummed in the background to boost the layers behind the piano and again it’s just another feelgood track. Outro closes out Halfway To Infinity in the best way possible. It’s a six minute goodbye from Rat Trap, and it contains everything that the band have performed over the last three albums. 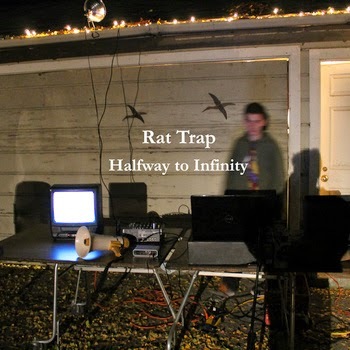 There’s melodies, acoustic guitar, electric guitar, chilled vocals, strings, drum beats, big booming finales and even a little diddy at the end to close the curtains on what has been Rat Trap’s best record (yet?). It’s a shame they’ve decided to call it quits but honestly they have always been a memorable band for me. Having them send me their music when I was just starting out was a risky decision but I’m so glad they trusted me to write poorly-constructed sentences about them. All the guys are pretty cool guys and I’m sure we’ll keep in touch until the next time something musical comes out of their buttholes. But yeah. Halfway To Infinity is a great record and to quote Rachel from Friends it’s “the perfect way to say goodbye”. See ya round Rat Trap. Stream Halfway To Infinity below, purchase it for however many currency you want and for more music reviews, free downloads and a kiss goodbye check out Exploding Head Syndrome on Facebook and Twitter.